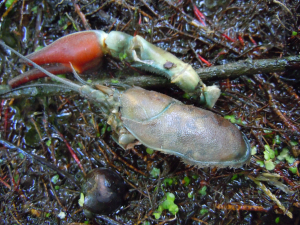 I would often find signal crayfish remains (only claws and head) on the river banks. Does anyone know what species preys on crayfish but leaves these body parts behind. I know herons eat them but I thought they ate them whole. Are otters and mink the only other possibilities?